You finally took the plunge. You did the research, built your website (probably with WordPress) and launched the online side of your business. You made sure you were listed on and started ranking on Google, Bing, & Yahoo. But unlike the folks in those UPS commercials, you don’t just sit back and wait for the customers to just show up. You know that 98% of the traffic that comes to your website won’t buy the first time they hit it. They’re just doing research or window shopping. The fact is, on average, 70% of the people who visit your website will never be back. So how do you engage with potential online customers who are “just looking”? You start by not being average. And that starts with a Lead Magnet. A Lead Magnet is something you offer a potential customer that has sufficient value to them that they’ll trade their email to get their hands on it. A Lead Magnet is also a great way to create an unforgettable first impression. 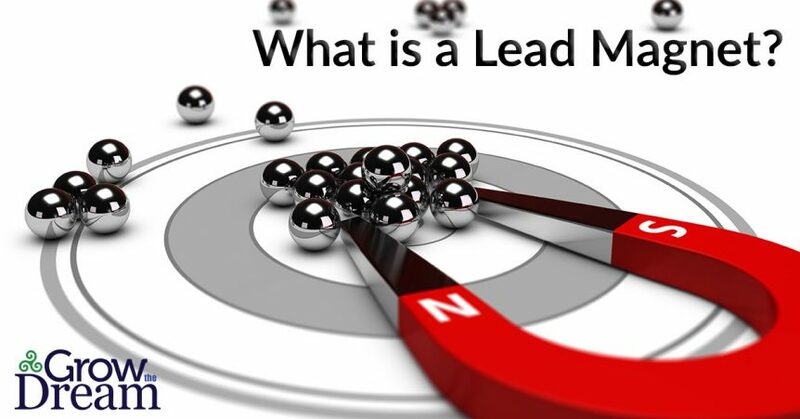 The point of a Lead Magnet is to increase the number of targeted, qualified leads that you can build relationships with that will lead to sales. For nearly 20 years, we’ve taught our small business clients how to strategically locate these leads. It starts with discovering your ideal customer – the customer at the center of your hypothetical bullseye who needs your product or services the most and will exchange the most money for it – or buy multiple times. Your marketing strategy begins and ends in one place: the customer. Who is your best prospect? How much can you possibly know about them? As narrowly as possible, identify the common traits that your very best buyers share with one another. How does this connect to Lead Magnets? Glad you asked. The best Lead Magnet for your business – the one you need to develop should solve a specific problem, with a specific solution for a specific group of your potential customers. Therefore, your Lead Magnet must be something that they want or need and can take advantage of right now. If they’re not seeing the value within 5-10 minutes, you’ve likely already lost them. And the more specific you are about the benefit of your lead magnet, the better it will convert leads. It seems counterintuitive, but instead of trying to figure out how to offer a broader solution, or one that is just like everyone else’s, look for ways to eliminate the people who aren’t your target customer. Being ultra-specific is the best way to capture a specific audience. And that’s what you want – targeted, qualified leads. What Kind of a Lead Magnet Should I Create? Reports and guides are among the most common types of Lead Magnets, which is actually an argument against using them. Remember, you aren’t average – you don’t want to do what everyone else is doing, and if you do use a report or guide, it has to be super-specific and brief. If your ideal client is just getting started, offering them a toolkit or resource list can an effective Lead Magnet. Promote it as a starter kit, a glossary of terms they need to know to not look amateur, or templates for WordPress, PhotoShop, or any similar software system. 1-page “cheat sheets,” infographics, and handouts are great as Lead Magnets, especially if they cut straight to the point. You can also frame them as checklists, success blueprints, or shortcut mind maps. Also, any of the above can be translated into a video, if you have the equipment and knowledge. Video also helps build almost instant rapport with the potential client, increasing the effectiveness of your Lead Magnet. The best Lead Magnet will be of value to your best customer. That’s why they’ll give you their email address. And once you have that email address, you can take advantage of the Lead Magnet’s benefit to you – an opportunity to build a relationship with a potential customer. The best Lead Magnet will not just solve a problem, but if truly effective, will change the state of mind of your prospect so they are primed to do business with your company. But all that’s worthless without follow-up. Remember the 70% that don’t ever darken your online door again? By creating and offering the best Lead Magnet you can, it can cut that percentage down significantly. But only if you engage with that potential customer beyond the Lead Magnet. This is where automated systems like Infusionsoft and MailChimp really shine. If you’ve done your strategic work, one of the things you learned about your ideal customer is how often they have problems you can solve, and how often they like to be contacted. So you construct a campaign in Infusionsoft that periodically reinforces your burgeoning relationship. The first step for many is a quick Thank You for downloading the Lead Magnet, reminding them where they got it from, and encouraging feedback on the Lead Magnet itself – why not let them help you make it better? You can also set up an alternate campaign branch to reach out if they forget to download the Lead Magnet. Either way, by continuing to engage the prospect with information that is of value to them, they are far more likely – if they are your target customer – to be among the 30%+ that will return to your website to buy. By the way, don’t abuse this relationship. I recently had an experience with a company that was taking advantage of their email list by sending out multiple emails every day for 6 weeks. At the same time, they weren’t monitoring their inbox for customer service. As a result, they ruined their relationship with hundreds of existing buyers, the exact opposite of their intention. Building – or rebuilding – a client base is difficult. We all know the aphorism about people only buying from people they know, like, and trust. By creating and implementing the best Lead Magnet for your ideal customer, you can start building that bridge of trust. Follow-up, both automated and personal, reinforces that bond. That’s a good thing. Because here’s another percentage for you – studies say that prospects who don’t buy right away, but are engaged with the by company account for around 50% of online sales income. Now do you see the value of a Lead Magnet? Good job on the article. You nailed it! While I’m sure your podcast is fantastic, it’s not the format that works for me. I would love to subscribe to your blog, but sadly, you don’t give me that option. I expect more from sharp content marketers like you guys. You know, it’s about the meeting your customers where they like to be served axiom.